Experience innovation with the Zero wireless controller for PlayStation 3. The Zero controller is an entirely new ergonomic design, built to maximize comfort for all players while providing a unique and stylish appearance. With full six-direction tilt functionality, the Zero is compatible with all PS3 software and control schemes. 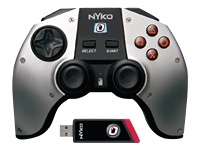 The Zero is powered by an included NiMH rechargeable battery that provides up to 25 hours of wireless gameplay. When necessary, simply plug the included charging cable into the PS3s USB port and play and charge the controller simultaneously or use the included AA battery pack. The Zero is the first controller to feature LED back-lit action buttons, heat dissipating aluminum panels and a hybrid metal-resin design. The Zero is the paramount in controller precision, design and engineering.